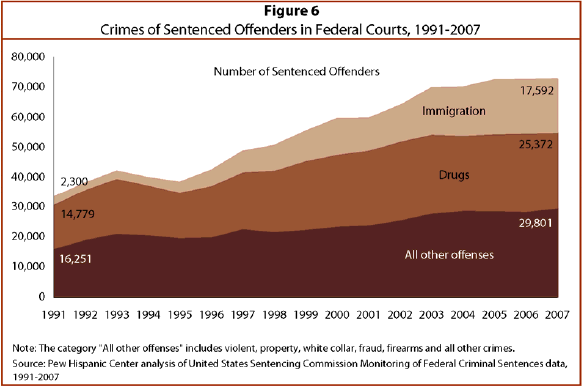 More than half (59%) of all offenders sentenced in federal courts in 2007 were sentenced for drug crimes (35%) or immigration crimes (24%). Drug crime convictions were the most prevalent offenses among sentenced offenders who were white (31%) or black (44%). In contrast, among Latino offenders, the share sentenced for drug crimes (37%) was second to the share sentenced for immigration offenses (48%). The distribution of offenders’ crimes was substantially different for Latinos who held U.S. citizenship and those who did not. In 2007, more than half (56%) of Hispanic offenders with U.S. citizenship were sentenced for drug offenses, 14% for immigration offenses and 30% for all other offenses. In contrast, more than six-in-ten (61%) non-citizen Latino offenders were sentenced for immigration offenses, 30% for drug offenses and 9% for violent, property, white collar and fraud, firearms and other offenses. Among sentenced Latino immigration offenders in 2007, fully 75% were convicted of entering the U.S. unlawfully or residing in the country without authorization, and 19% were convicted of smuggling, transporting or harboring an unlawful alien. The convictions broke down largely along citizenship lines. Among sentenced non-citizen Latino immigration offenders, more than eight-in-ten (81%) were convicted of entering the U.S. unlawfully or residing in the country without authorization. In contrast, more than nine-in-ten (91%) U.S. citizen Latino immigration offenders were convicted of smuggling, transporting or harboring an unlawful alien. Beginning in 1995, the Immigration and Naturalization Service (INS) implemented an initiative called Operation Gatekeeper, which was designed to increase border security. Since that time, the number of immigration offenders in federal courts has increased from less than 10% of all cases prior to 1996 to 24% in 2007 (USSC, 2004). As the U.S. federal government sentenced more offenders for immigration crimes, a growing share of Hispanics were sentenced for those crimes. This is particularly true for Hispanic offenders without U.S. citizenship. Between 1991 and 2007, the share of non-U.S. citizen Hispanics sentenced for immigration crimes more than doubled from 28% to 61%.